Handball’s Next Generation is Coming! The Race 4 Eight is in good hands with the Next Generation, as a talented group of late teens to mid 20-something stars are poised to carry the R48 handball torch into the next decade. The 26-and-under NextGen includes current and former collegiate and junior national U.S. and Irish champions, international phenoms, and rising contenders on the cusp of breaking into the game’s elite. Each of the young elites boasts tremendous passion and dedication for the sport, as well as a burning desire to reach the top. In addition to being motivated, dedicated, and passionate about the sport, handball’s Next Generation are also thoughtful, interesting, and tremendous handball ambassadors. The 26-and-under Next Generation will be competing for the R48 Next Generation Cup during the 2018/19 R48 Men’s Pro season, honoring the highest ranked Next Gen star on the 2018/19 R48 Men’s Pro tour at season’s end. Learn about 11 of the Next Generation’s playing styles, as well as goals, passions, and inspirations for handball below. To compete for the 2018/19 R48 Next Generation Cup, a player cannot start the season ranked in the R48 Elite 8 and/or have previously won an open/pro R48, USHA Nationals, Irish Nationals, or All Ireland championship. To be awarded the 2018/19 Next Gen Cup, the winner must participate in the 2019 WPH R48 Aces Player’s Championship in Salt Lake City, UT. Ivan Burgos: Burgos is one of the game’s most exciting junior stars, willing to sacrifice his body for any ball, while challenging himself against the game’s best at every opportunity. This Canadian prodigy possesses an intense passion for the sport, coupled with blazing speed, two-handed power, and the willingness to go for his shots at any moment against any opponent. The Maple Leaf is in great hands! I hope to qualify this season and be one of, if not the youngest qualifier in WPH history, and eventually, being steady in the top 8 has always been a goal of mine. Current USHA Collegiate National Champion Leo Canales, Jr. Besides setting goals for minor improvements in my game, ultimately, I want to be able to compete with the very best. If I can, then I’m fairly confident that wins will follow. My goal in handball is to be thought of as one of the top players and to be a player that everyone enjoys to watch, while giving back to the game any way that I can. My goal in handball is to win at the top level! Be the best I can be! I want to inspire the younger generation to start playing handball and love the game as much as I do! Goal for this year is to take down big names and break into the top 8. My passion comes from simply just loving the game and being very competitive and wanting to be the best I can be. My passion for handball comes from the love of the game. I never really liked team sports so handball was perfect for me and I’d spend hours on the court just rallying with myself. My passion comes from all other players, especially at the pro level. I love to see these guys play their hearts out, sacrificing their bodies and making amazing shots. My family has also played a big part in my passion, they push me to always be the best version of myself. Ryan Bowler. I would always follow the qualifiers and the pro tournaments and seeing a friend I often spar with competing with some big names was definitely inspiring. I’ve had a lot of role models growing up in the handball scene in NorCal. The Dean Crispens, Chris Ticos, Mike McDonalds and Lenardt Delatorres were gracious enough to let me get in the court with them throughout my college years. The players that have inspired me the most would have to be my dad and my Coaches at Missouri State. Not because of what they can do on the court but what they have meant to me off it. My dad, Jake Esser, and coaches, Tommy Burnett and Brian Watson, have done so much for the game and have all been big believers in me. They are always asking me about every game I play and supporting me all the time and I love to make them proud. They’re all people I strive to be like. I’ve watched a lot of handball matches over the years, and there have been so many pros, both current and past, that have shown me the highest level. A lot of pros and local players have been incredibly supportive off the court all around the country, housing our team for tournaments, giving their time to clinics, and running the desk at tournaments I’ve attended, and even giving support for things like travel. I’ve been incredibly moved by these things, but I think it shows how much all of these guys want to grow the game and see it thrive. It’s very difficult to narrow it down to one player, but I’ve been very fortunate to have Sam Esser as my doubles partner and fellow competitor throughout all my years of playing. Having such a sparring partner and friend inspired me to find new levels of play and continually improve. 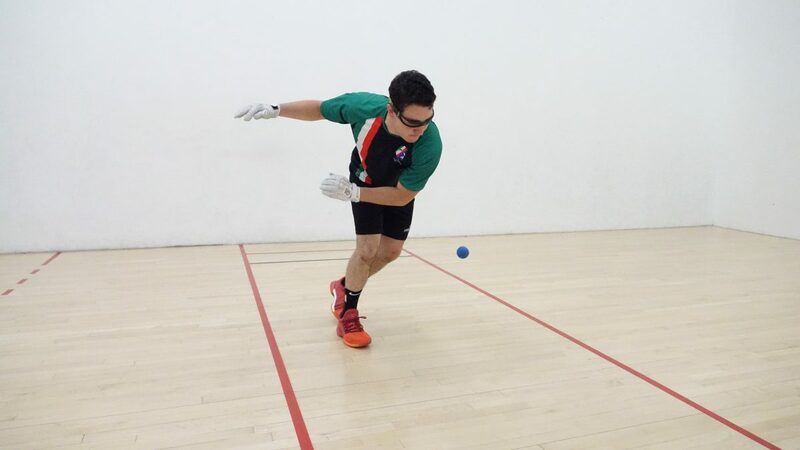 As a junior player, I don’t think I ever saw how consuming handball would become, just that I loved it, but I’ve always had a class competitor, partner, sportsman, and friend that wanted to play. In addition, I owe a lot to Sam, Jeremy Young, Matt Vollink, Alex Birge, and their families for supporting me. They’ve shuttled me to countless tournaments, paid for numerous dinners, and always made the travel something I love to do. My collegiate coaches, Tommy Burnett and Brian Watson, have continued that support during my time at Missouri State and given us the means to play in places around the country. All of this has given me the steps to keep playing and keep improving and I’m very lucky things worked out. Emmett Peixoto has inspired me to play at the pro level. Since I started playing in 2008 he has been the player to look up to and gun for. After a long summer of day-to-day training preparing for the Worlds, I’m keeping my form by playing games and doing some cross training and staying active and fit for this upcoming season. Being full time in grad school and working a job for Missouri State University, it’s hard to find time to put in all the training I would like for tournament season. That being said, it’s about making the most of your opportunities when you have them and that’s what I plan on doing! For this season I am taking everything that I have learned over the past few seasons – there is no such thing as failure, just an opportunity to learn. I have taken the elements of training that have worked for me and tried to isolate and eliminate the areas that have left me falling short. I have a great team around me, a great program and my mental game is stronger than ever so I am looking forward to a great season and a successful year. To prepare for this season I’ll be playing handball and working out once a day and also drinking more water to stay hydrated. At the minute the weakest area of my game would be my fitness, so I’m trying to build it up and really just trying to become more match fit! I’m watching a lot of handball online, watching other types of styles and trying to find weaknesses in other pros games! I am still recovering from shoulder surgery, so I have been hitting rehab hard and playing one handed. Looking forward to get back on the tournament scene for the first time in a year.